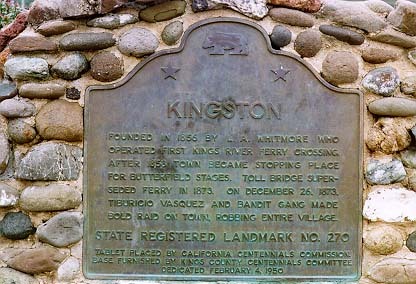 Founded in 1856 by L.A. Whitmore who operated first Kings River ferry crossing. After 1858 town became stopping place for Butterfield stages. Toll bridge superseded ferry in 1873. On December 26, 1873, Tiburicio Vasquez and bandit gang made bold raid on town, robbing entire village. Kingston Park, Douglas Ave, 0.4 mi W of 12 3/4 Ave, 1.1 mi SW of Laton. Return to other landmarks in Kings county.